This should get you up to speed on who the composer was. Puttering along with Jaron Lanier’s Who Owns the Future, I was intrigued to find out one of his earliest music heroes was the enigmatic Conlon Nancarrow (decades ago, Lanier would hitchhike from southern New Mexico to visit Nancarrow’s “bunker-like” studio in Mexico City, where he would hear the player-piano works in their primal setting — so, you know, not a typical experience). Nancarrow emerged from deep obscurity in the ’80s, but by the time I got around to digging for him in the ’90s, he was damned hard to find. I’m not at all surprised he isn’t better known. The biggest puzzle to me is why his sole album on Columbia (from 1969, back when major labels still threw everything off-beat against the wall to see what might stick) has not been reissued along with the torrents of lesser obscurities. The 1750 Arch LPs were done on the original player pianos with Nancarrow’s supervision, then all but vanished within a year or two of being released. Lanier notes that “the digital recordings that are around somehow miss the power of the music.” They are on Wergo, I checked out a couple volumes, and I’m with Lanier — I didn’t like ’em. They sounded arid and harsh, sometimes thick with ideas and reflections, but never the least overwhelming. 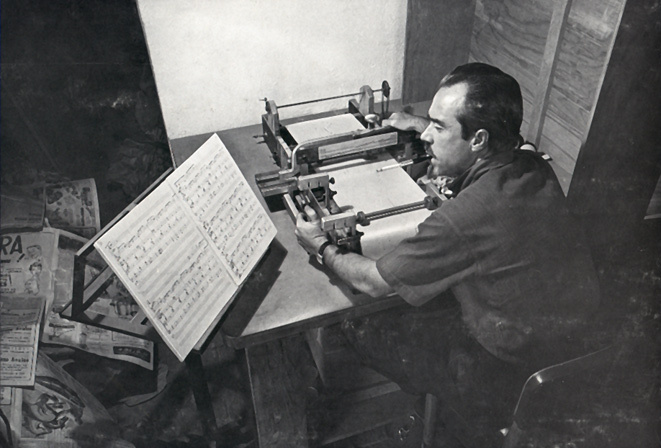 The reason, however, is obvious — one of Nancarrow’s player pianos was damaged beyond repair, so the Wergo versions were made by double-tracking the piano that remained (i.e., not at all the way the composer intended). There’s a German set of recordings done on regular pianos and various and diverse human-played interpretations around, but I think Lanier is on to something when he says mechanical reproduction is essential to hearing the true Nancarrow Studies. He’s a bit out of touch, though, since you don’t have to scrounge through used-LP bins anymore for the 1750 Arch material. The CD set is reasonably priced and though the Studies are sadly not in sequence and only the works up through No. 41 are included, looks to me like the only existing chance to hear them close to the optimal way. Miles To Go will report back on the results. This entry was posted in Classical Music and tagged Conlon Nancarrow, Jaron Lanier by milomiles. Bookmark the permalink. A fascinating charachter. I read his “bunker-like” house was designed by the great Mexican architect O’Gorman during the final years of his career (when he turned his back on modern architecture and made a cave his home before killing himself). I have never found any pictures of the house but I am very intrigued. As for the recordings, I only heard the Wergo´s from my dad´s collection but didn´t like them much. Maybe the set you recomend is the real thing. The Wergos are just weird. I certainly prefer some regular-piano versions. Don’t think I even kept my copies. Yow! Your comment has inspired a whole ‘nother post — about Juan O’Gorman!